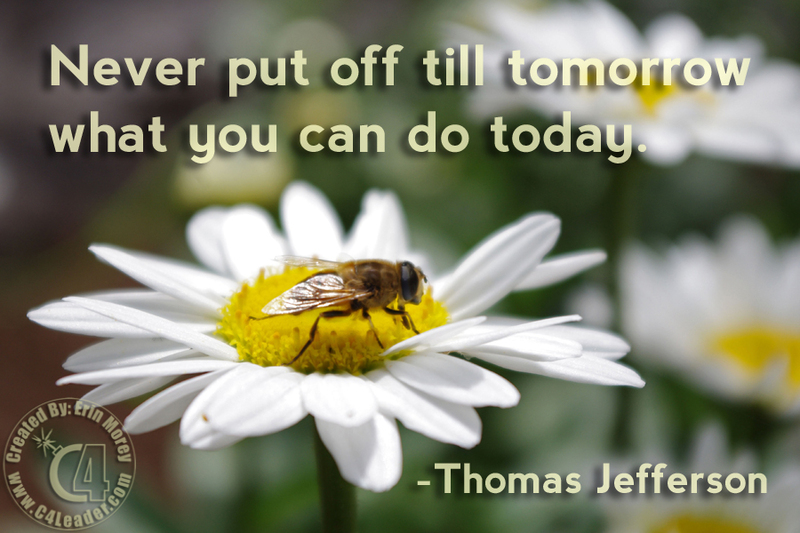 Perhaps one of the most common quotes people hear is this one from Thomas Jefferson. People tend to be procrastinators, putting things off until the last minute. It's in our nature, and I believe that our brain is programmed to put off until the item is absolutely necessary so that we can enjoy the "comforts" of today, even if that comfort actually puts in jeopardy something we greatly desire tomorrow. How many times did you put off the book report in school? How about the work assignment? A sale presentation for a client? Work around the house? The list goes on and on. And even those of us that know better often fall victim to it. So, we must remain ever vigilant to the programming, and strive to work toward our goals today, rather than waiting for the tomorrow that never comes. So what are you going to do today?